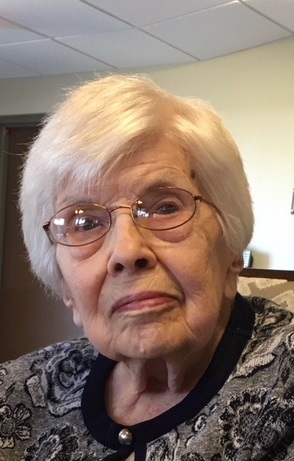 Obituary for Mildred "Millie" (Maskey) Caldieraro | Williamson Funeral Homes, Ltd.
Mildred “Millie” (Maskey) Caldieraro, 98, of Staunton, Illinois, passed away on March 19, 2019 in Carlinville, Illinois. She was born on October 15, 1920 in Livingston, Illinois to the late John & Mildred “Milka” (Perokovich) Maskey. She married the late John “Beppy” Caldieraro on November 10, 1946 in Springfield, Illinois, & was married for 21 years until his death. After graduating high school, Mildred entered the work field & never stopped. Her jobs included private secretary at the Madison County Courthouse, the railroad, Hefer’s Grocery Store in Staunton, & she retired from Bill’s IGA in Staunton, Illinois. Mildred loved school and every job she had & never complained about work. She was a faithful member of St. Michael’s Catholic Church in Staunton, IL. Mildred was a loving wife, Mom, Grandma, Aunt, & friend to many people. She loved attending her grandchildren’s school & sporting events until her health wouldn’t allow it anymore. Anyone who knew her knew not to call her at 8:30 in the morning because she was doing WSMI’S “Spellbound”. She read two newspapers every morning, loved word search puzzles, and playing board & card games when grandchildren had overnight stays with her. Survivors include sons Tom (Phyllis) & Bob (Kay) of Staunton and daughter Lisa (Eric) Pingolt of Carlinville. Mildred has six grandchildren – Steven, Tyler, & Eric Joseph Pingolt, Heather & Matt Caldieraro, & Lesly Caldieraro & two step-grandchildren – Kacy Heim & Dustin Graves. Mildred was preceded in death by her husband John “Beppy”, her parents, three brothers – John, Tom, & Joe & four sisters – Kate Bryant, Mary Fox, Barbara Stevens, & Norma Maskey. Friends may call from 6 to 8 PM on Thursday, March 21, at Williamson Funeral Home in Staunton. A Funeral Mass will be held on Friday, March 22 at 1 PM at St. Michael’s Catholic Church in Staunton with Rev. George Radosevich officiating. Burial will be in Memorial Park Cemetery – Staunton, Illinois. Memorials are suggested to St. Michael’s Catholic Church in Staunton (a place very near & dear to her heart).